a signed and numbered limited edition of 590 archival gicle'e prints available. Original NFS. Artist's private collection. ​In the early 1970s, I fell in love with a beautiful silver gray breed of dog called the Weimaraner. I knew nothing about the breed except for its sheer beauty. I talked my husband into looking at puppies in a nearby town one day and the rest is history. We were in for the time of our lives for the next 16 years as this beautiful, agile, energetic – and willful -- dog shot through doors and windows, counter surfed unknown quantities of human food, from sticks of butter to apple pies, and once managed to get a quarter side of beef out of the freezer. Elsa, named after the lion in Born Free, was regal by any standard and would have made a great hunting dog. She did make a great painting subject. She was about a year old when I painted the above chalk pastel of her. Sired in Germany, I was later told she had a typical Hauserman head. The Weimaraner is a fairly large dog bred originally for hunting in the early 19th century and used by royalty for hunting large game such as boar, bear and deer. As the popularity of large game hunting began to decline, they were used for hunting smaller animals like fowl, rabbits and foxes. Many in the states are now solely pets with the charge of keeping their owners fit to help them burn off their energy. 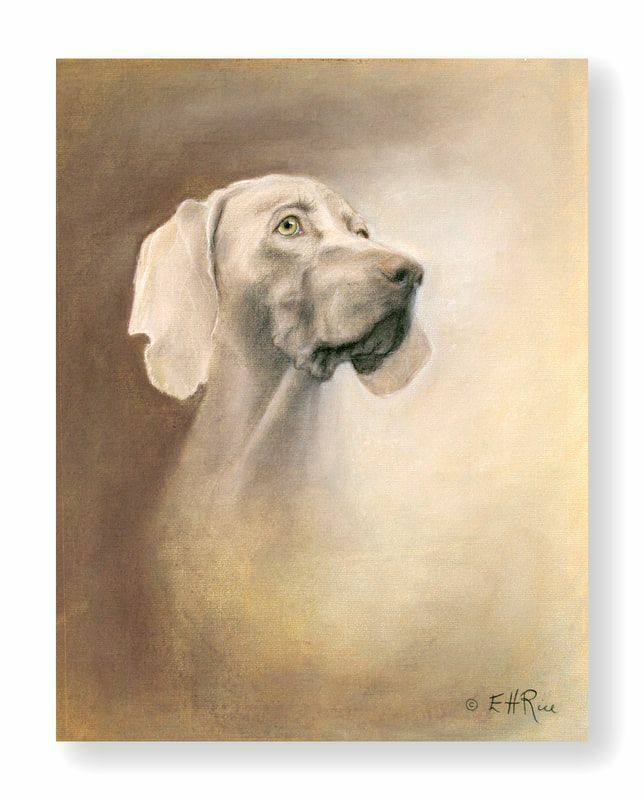 I advertised The Spirit of the Grey Ghost in the Weimaraner of America Magazine when my print was published and was astounded at the response. No matter how many tales of Weims destroying homes, apartments, sofas and car interiors I heard, without exception Weimaraner owners were madly in love with their spirited companions.